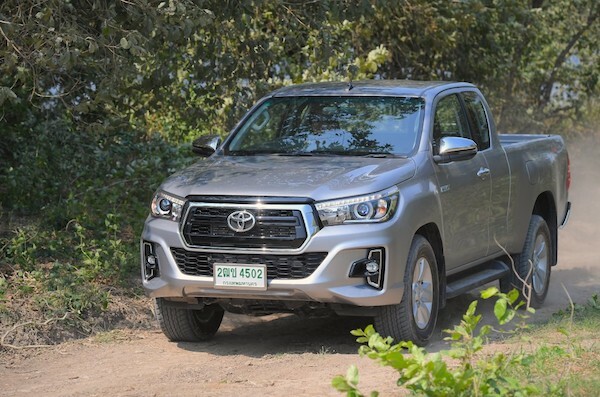 The Toyota Hilux is #1 in Thailand for the 4th month running. New vehicle sales in Thailand celebrates one full year (ie 12 consecutive months) of double-digit year-on-year gains with August deliveries up a whopping 27.7% to 86.814 units, leading to a year-to-date tally up 21.1% to 657.878 and on track to break the million annual sales milestone for the first time since 2013 with BSCB estimates putting the 2018 Thailand market around 1.050.000 units. Once again brand leader Toyota performs drastically better than the market at +69% to 31.2% share vs. 29.6% YTD, now well above double any other manufacturer in Thailand including Isuzu (+3%) at 15.1% vs. 17.1% so far in 2018. Below Honda (+6%) edging up but scoring a higher share than YTD at 13%, Mitsubishi (+28%) and Ford (+23%) are back above Mazda (+35%) even though they match the market at best and Mazda over-performs. Recent local producer, Chinese MG, is once again the most dynamic at +161% to 2.2% share at #9, with Kia (+50%) the lone great performer in the remainder of the charts. Model-wise, the Toyota Hilux surges 49% to snap a 4th consecutive pole position, something it had not achieved since December 2016. So is the Hilux likely to overcome the D-Max for the 2018 pole position by December? Its advantage over the Isuzu D-Max is 1.632 units this month vs. 1.032 in July, 1.939 in June and 131 in May. Applying the August advantage to the last 4 months of the year brings the Hilux almost exactly at the same annual volume as the D-Max for 2018. Applying the May-August average advantage (1.183) brings the Hilux 1.700 units below the D-Max. So probability-wise the answer is: probably not, and we may still see the D-Max post a second consecutive year at #1. Elsewhere in the ranking, the Ford Ranger (+22%) returns to the third place it holds YTD making the podium 100% pickup, the Mazda2 (+42%) remains the best-selling passenger car ahead of the Toyota Yaris (+167%) and Yaris Ativ (+202%) and the Toyota Fortuner (+64%) leaps back inside the Top 10 at #9. We welcome the Mitsubishi Xpander at #29. Full August 2018 Top 30 All-brands and Top 70 models below.